my bare cupboard: Thai coconut chicken noodle soup "
If I have to put up a noodle shop , this noodle soup would be my specialty . That is after , I found another soup recipe that's worth cooking , again and again . 'twas the best chicken noodle soup outside Thailand ! This time the slices of chicken and I also used some chicken wings , stays prettily on top , so it was easy to photograph it . For sure adding the noodles makes a much more substantial fare ! 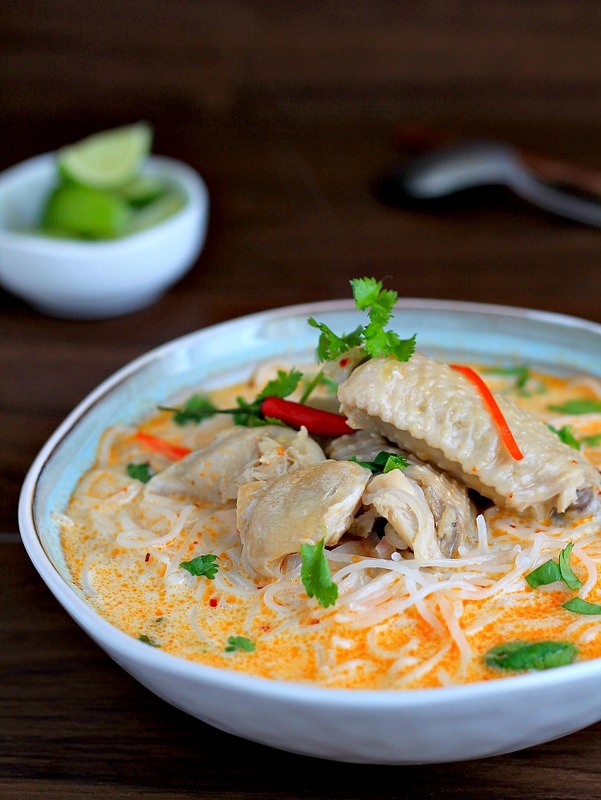 Hopefully , you can find the ingredients at your local Asian store , the aroma of the soup base while you're boiling it is such a delight and it's worth searching for galangal , lemongrass and lime leaves to make this . * Peel off the tough outer layers of the lemongrass , leaving the tender white center , cut into 3-inch pieces and crush with the flat of a knife . * Pour stock in a saucepan , add in the lemongrass, galangal ,lime leaves and 1/2 of the shallots . Bring to a boil keep an eye on it or it'll boil over , then reduce the heat , cover and simmer gently for an hour . Strain the mixture and discard solids . Return the stock to the pan . * Cut chicken into bite-sized chunks and set aside , add the chicken wings to the stock , add in the fish sauce , lime juice , chillies , sugar , coconut milk and the remaining shallots . Bring to a boil then reduce heat and simmer for 10 minutes then add in the the chicken chunks and cook for another 5 minutes . Stir in chili sauce in the last few seconds and give it a good stir . If using only chicken pieces , boil for 8 minutes . 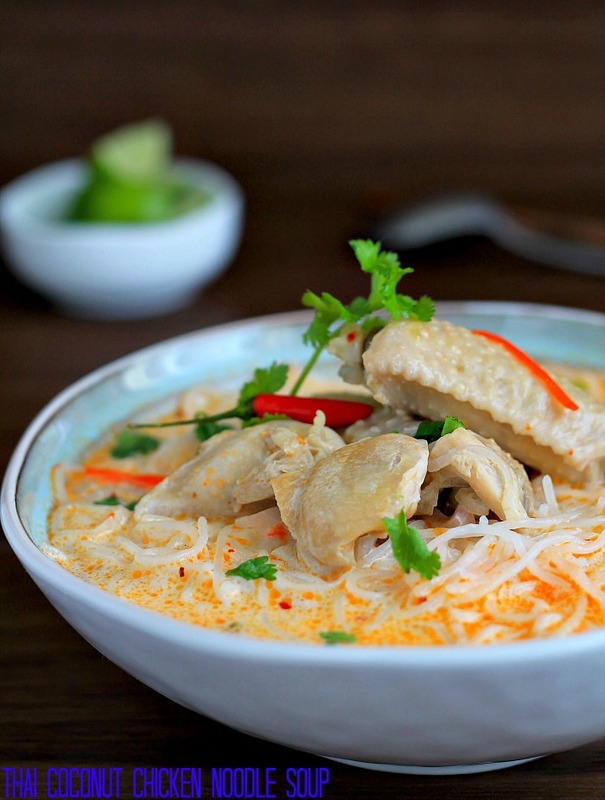 * Meanwhile , boil dried noodles for 3 minutes , drain and rinse then divide into 2 bowls , pour in the coconut-chicken soup , garnish with some cilantro leaves and serve hot . I would be happy to be your dinner guest when you are cooking this again! 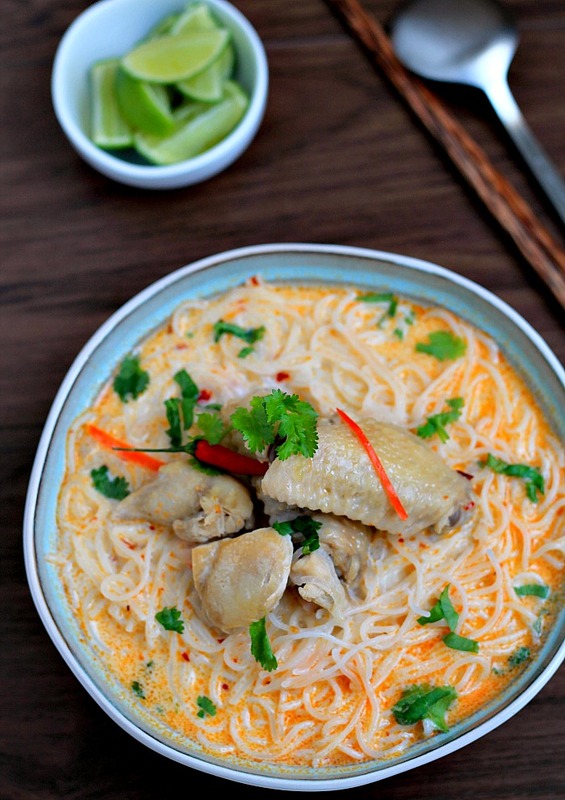 It looks delicious, and I love noodle soup, especially with Asian flavours such as this! I would slurp on the soup to the last drop! Thanks for linking with CYB! Hi Anne, I'm getting hungry by looking at this delicious chicken noodle. Would love to try it for sure. BTW I also can't see your update on my foodie link too. I think your rss feed has broken. You can try re-update your rss feed again. This noodle soup really looks delicious. Merry X'mas and Happy New Year to you and your family! I can imagine... You must be slurping your Thai chicken noodle soup after these shots... LOL! They must be extra warming to eat at cold chilly weather. Did you go.... Slurp! Slurp! Ahhh! ??? Oh your bowl of Thai noodles look so yummy, very similar like our laksa here, I need to make this version one day! Merry Christmas and Happy New Year to you. Hi Anne, woooooohuuuuu, I definitely love this and need 2 big bowls, please.. .. Yours look extremely good. Thanks for sharing your recipe. What a bowl...I can totally imagine why you could not click the photos the first way round :-) I am not too fond of coconut milk, but this one looks awesome!